Step Into a World of Elegant, Contemporary Cruise Ship Design. Avalon ships were built with your comfort and pleasure in mind. 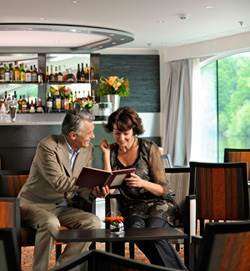 Wherever you find yourself on the ship, elegant, contemporary spaces provide plenty of seating and cozy spots to relax. Meticulous millwork, hand-applied finishes, contemporary décor, and designer lighting surround you, providing a place you’ll enjoy just relaxing and immersing yourself in the wonders of your river cruise adventure. When Avalon Waterways unveiled the Avalon Panorama, the industry’s first Suite Ship®, we redefined the river cruise experience by enhancing traveler comfort and views, while also bringing indoor/outdoor living on board. The new vessels deliver an experience like no other. While Avalon has always provided river cruisers the most spacious staterooms in Europe (the entire fleet features a minimum room size of 172-square feet), with 12 ships boasting two full decks of suites – 200-square foot Panorama SuitesSM (178 total) and 300-square foot Royal Suites (6 total) – the cruise line is offering cruisers even more room to relax and take in 360-degree views of Europe. Each of our Panorama Suites comes complete with a large seating area adjacent to a Wall-to-Wall Panoramic Window. When opened, this nearly 11′ x 7′ floor-to-ceiling window transforms the entire Suite into the category’s only Open-Air BalconySM. With a focus on bringing the beauty of Europe inside, Avalon’s Open-Air Balconies offer our travelers a fresh air, Panoramic Cruising experience complete with epic views, in every weather condition, without compromising room space. And when each room’s Wall-to-Wall Panoramic Window is closed, the Open-Air Balcony is transformed into a contemporary, light, inviting and inspirationally designed sitting room that’s perfect for relaxing, reading a book or taking pleasure in a romantic dinner. Avalon’s Open-Air Balcony can be enjoyed any hour of the day, year round, adding considerable comfort to the overall guest experience. With our Suite Ships®, we’re pioneering the look of river cruising. Not only are our staterooms and views 30 percent larger than any other small ship in Europe, providing cruisers a renewed feeling of freedom and space, every component of the experience, from bed and bathroom positioning and color palette to storage space and sound-proof insulation, was wistfully designed for our cruisers to ensure they enjoy all that river cruising has to offer. And perhaps most surprisingly, Panorama Suites are available at a price similar to that of ordinary staterooms of other river cruise lines. Mirroring the on board cruise experience found on all of Avalon’s ships, each of our new Suite Ships® also feature a club, main lounge and dining room with sweeping views, hair salon, Sky Deck whirlpool and Sky Bistro. Our Suite Ships® underscore Avalon’s dedication to energizing the river cruise category. For years, we have inspired upscale design innovations that have elevated the industry standard, including the introduction of floor-to-ceiling windows on two decks of every Avalon vessel. We were also the first to bring a larger stateroom with deluxe hotel-style design, (the Avalon Deluxe Stateroom) to an entire fleet of ships, making us the most contemporary and consistent river cruise operator around. Avalon Waterways not only provides travelers the most innovative fleet of ships in Europe, by design, we create panoramic access to a destination, uncompromising views, space to unwind and the choices that provide our cruisers the most engaging and immersive journeys imaginable.